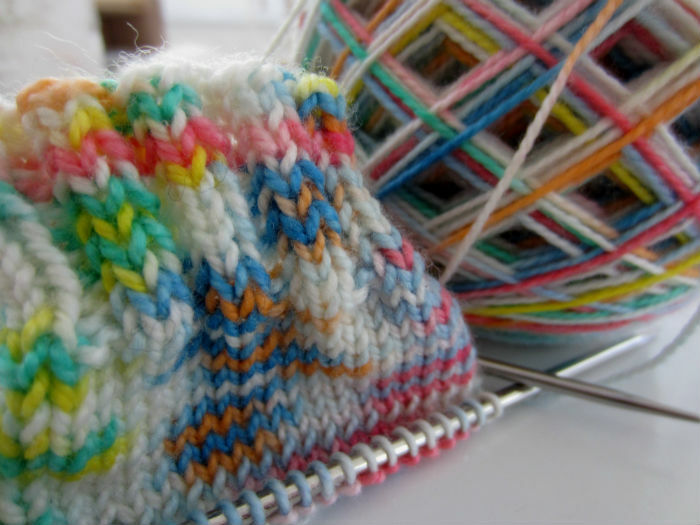 The night before Felix was born, I cast on two pairs of socks, just to have some simple knitting lying around my favorite haunts in the house: one on my nightstand and one in my knitting basket by the sofa. This is the start of my Easter Egg Rainbow socks, which have been living on my nightstand. I haven’t got very far on these despite having spent more time in my bed in the last 10 days than perhaps ever before. I seem to get caught in a time warp while I’m in bed, where nursing and staring at my baby, and perhaps a little dozing takes five hours, but it’s only felt like two. I hope to spend a bit more time on these, because I’m really having fun watching the color distribute. These are going to be very happy, springy socks. One of my purchases from my new local yarn store Yak n Yarn. It’s Rowan fine art sock yarn, and it is merino, mohair, silk and polyamide. You know me and mohair, I can’t resist it–and if it’s mixed with silk? Even better! These socks are for Brock. 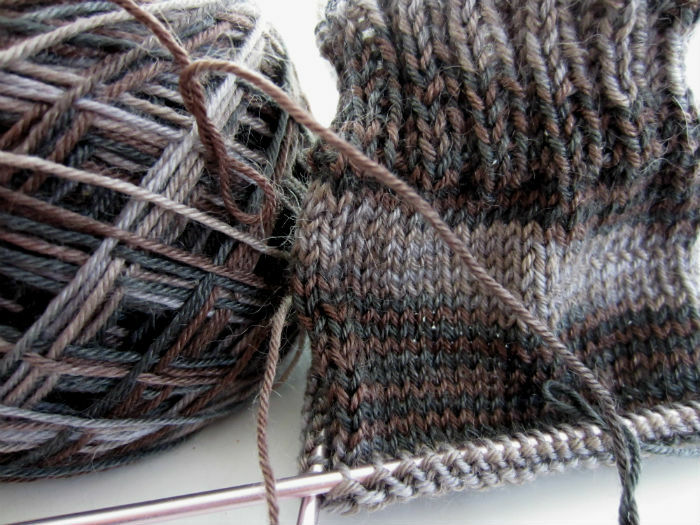 I still owe him two sweaters, but since I don’t have the mental fortitude to knit sweaters right now, I’m knitting him two pairs of socks instead. I’m not sure if he will see this as any consolation, but it’s what I have to offer. I’m loving this color progression. It reminds me of that mud pie stuff that’s made with chocolate pudding with a crushed oreo crust–but in a classy, made of silk and mohair type of way. 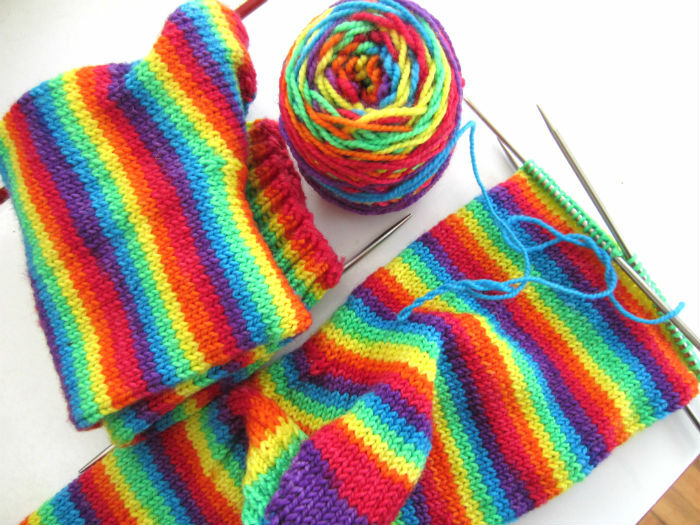 I’ve been knitting on these in the evening during Felix’s after dinner nap. I should mention that this after Felix’s dinner, not mine. I usually have just enough time to eat my dinner and get settled in enough to knit three or four rounds before Felix is ready for dessert. Felix and I are still working out where knitting falls in our relationship, but I am finding time, little by little, to resume some parts of my life that aren’t all about baby. Now dishes and laundry, I haven’t quite figured out how those fit in yet.